I love Spanish tapas--everything about them, really. The lively, spicy flavors that play on your tongue, the creamy and crispy juxtaposition of textures, the fact that they're small in portion and meant to be ordered liberally and shared among a table of friends. Some of my favorite NYC meals have taken place at dark, cozy little tapas bars like El Quinto Pino and Tia Pol, where I used to go regularly with my old roommate David when we shared a two-bedroom apartment in Chelsea. We'd stroll over to 10th Avenue on a freezing, winter night and sit huddled over a tiny table sharing bites of food and stories from our days. I loved those years. 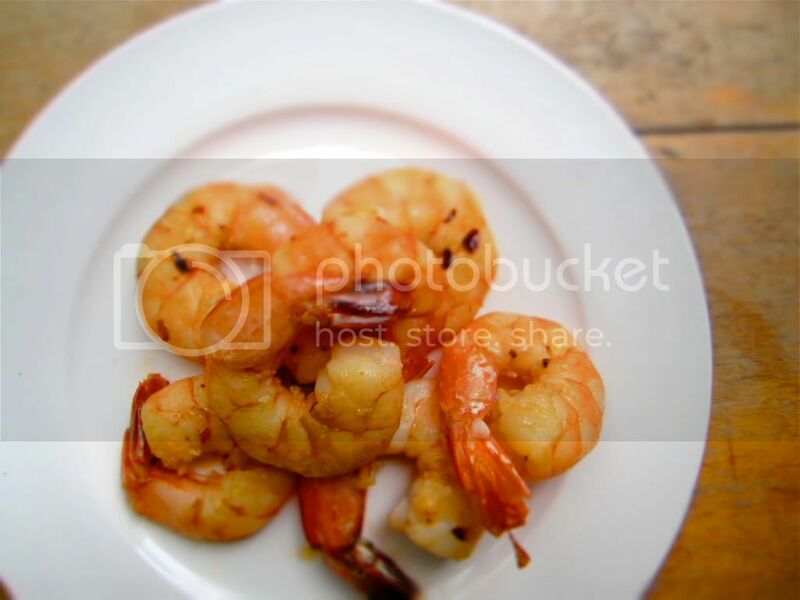 This recipe for a batch of fiery, fragrant shrimp sauteed in olive oil, garlic slivers and some hot red pepper flakes and finished with a generous shower of fresh lemon juice is both immensely satisfying and very, very easy. It'll feed a crowd in a pinch and leave everyone extremely happy. Gourmet's Quick Kitchen says that you'll want this recipe "in your back pocket for those evenings when you have an impromptu gathering of friends and need an easy crowd-pleaser." I couldn't put it any better myself--like all tapas tend to be, it's perfect for that exact purpose. I like to eat them with warm, crusty baguettes. Pat shrimp dry. Cook garlic, red-pepper flakes, and sea salt in oil in a 12-inch heavy skillet over moderately low heat, stirring occasionally, until garlic is pale golden, 4 to 5 minutes. Increase heat to moderately high, then add shrimp and saute, turning occasionally, until shrimp are just cooked through, 3 to 4 minutes. Remove from heat and stir in lemon juice, then transfer to a serving bowl. Serve warm or at room temperature. I love shrimp!! This looks so good right now..